The Joy of Sox®, a nonprofit that provides new socks for the homeless, recently upgraded the security on its website. 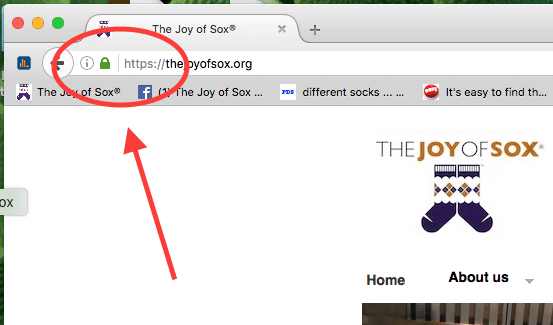 Their site, TheJoyOfSox.org, now has HTTPS and a GREEN padlock in the address bar! Simply, it means the website is encrypted and secure. That protects any information that is entered on the website (name, address, etc.). Their donate page has ALWAYS been encrypted, but now the entire site is. Why did they spend the time and money to do this? Anyone who enters information into a website should check the address bar on their browser to make sure that the page has the HTTPS, showing that it is encrypted, and the green padlock to show that the site is verified.